Johns Hopkins researchers have published new data that suggests epigenetic changes controlling how DNA operates, provides survival advantages to a subset of pancreatic cancer cells. The results, published in the Nature Genetics article, “Epigenomic Reprogramming during Pancreatic Cancer Progression Links Anabolic Glucose Metabolism to Distant Metastasis,” show that these changes allow the cancer cells to thrive in organs like the liver and lungs, which provide the cells with the sugar-rich blood supply needed for their survival. 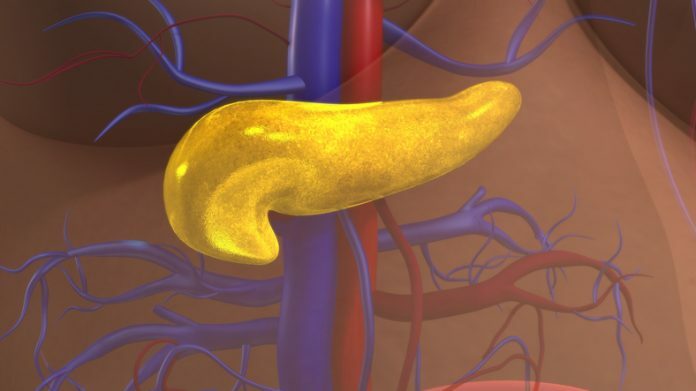 Even more interestingly, the researchers reported evidence that an experimental drug—not approved for human use—can reverse the epigenetic changes to block tumor formation in lab-grown pancreatic cancer cells. The scientists are optimistic that this new data may lead to more efficient treatment strategies against metastatic pancreatic cancer, which is universally lethal. Metastasis, or cancer spread by the formation of tumors at new sites, is generally what makes cancers deadly because surgery and other treatments are unlikely to find and destroy every cancer cell—especially true for pancreatic cancer, which usually goes undetected until after it has spread. To better understand the formation of metastases in pancreatic cancer, the research team collected tumor samples from eight patients with the most common form of pancreatic cancer, pancreatic ductal adenocarcinoma, immediately after their deaths. Samples were taken from the original, or primary, tumor in the pancreas and any detectable nearby and distant metastatic tumors. The tumors' genomes were then analyzed for genetic mutations, or alterations in their DNA. No direct DNA mutations were found that directly linked to successful metastasis, so the investigators decided to examine the landscape of the pancreatic cancer epigenome using a combination of stains on patient tissues, direct examination of the proteins that wrap DNA, and whole-genome sequencing of the detected epigenetic changes to map precisely where they were located. Interestingly, the researchers reported that no significant changes were seen in the tumors of patients whose cancer spread only locally. But tumors from patients with distant metastases to the lung and liver showed massive epigenetic changes that mapped to large, block-like segments of the genome, both in the distant metastases themselves and in the section, or “subclone,” of the primary tumors they came from. Beyond pancreatic cancer, the block-like segments where the epigenetic changes were located could be universal across other types of cancer. “Although we haven't tested this idea yet, we know that similar epigenetic regions are important in other types of cancer, such as colon cancer, so it's likely that these large-scale epigenetic changes are occurring in them too,” Dr. Feinberg noted. The researchers next looked for what might control the epigenetic changes. Aware that cancers rewire their metabolism in ways that could change the epigenome and that distant metastases in pancreatic cancer naturally spread to organs fed by a glucose-rich blood supply, the scientists wondered if the tumor cells had altered the way they use glucose. Biochemical analysis showed that distant metastatic tumors consumed excessive amounts of glucose when compared to local metastases. The research team also found that distant metastases and their precursors processed glucose through a growth-promoting series of metabolic reactions called the pentose phosphate pathway, which oxidizes glucose-derived molecules into building blocks for tumors. Particularly important was an enzyme called 6-phosphogluconate dehydrogenase (PGD). To see if PGD and the pentose phosphate pathway were tied to the epigenetic changes the researchers had detected in distant metastases, they treated tumor cells from different sites in a single patient with the drug 6-aminonicotinamide (6AN), which is known to inhibit PGD but is not used in humans because of its severe side effects. The drug had no effect on the epigenetic state of DNA taken from the local metastasis, but it reversed the epigenetic changes seen in cells from the distant metastasis. Treatment with 6AN specifically decreased the activity of genes with malignant, cancer-spreading functions, like cell cycle control and DNA repair. “Hopefully, these investigations will help develop new drugs to treat this aggressive cancer and others,” Dr. Feinberg concluded.